1 of 1 Heat oven to 325 degrees . LIne a sheet pan with foil. Chop soft beef or turkey jerky (such as Boar's Head or Krave). 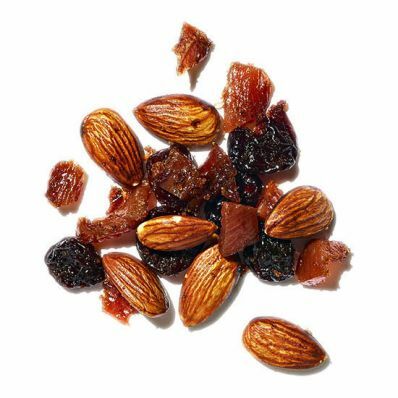 Toss in a bowl with dried cherries and whole almonds. Drizzle with olive oil and season with packed dark brown sugar, ground cinnamon and cayenne. Combine mixture with your hands to evenly distribute brown sugar. Spread onto prepared pan and bake at 325 degrees for 15 minutes. Let cool, then divide into 1/3-cup servings.